What type of Glycerin is listed on this site? ChemWorld has two categories of Glycerin. Both are Vegetable Based and meet the certification of a minimum of 99.7% concentration. Glycerin USP Kosher - This product has been packaged in a class 8 clean room and is safe for all your beverage, food and medical additive applications. This product is Kosher certified by the orthodox church. USP labeling implies that it conforms to all the legal and certification requirements of USP packaging and manufacturing. Our Glycerin USP is final packaged in conformance to USP requirements. This product comes in 1 Gallon, 5 Gallon, and 55 Gallon containers. Made in America! Glycerin - Glycerin is also referred to as Glycerine. This product is USP grade Glycerin that has been packaged in house and is intended for applications that prefer using USP grade Glycerin, but do not require the final product being packaged in a class 8 clean room. This product is packaged in sizes from 2 oz to 55 gallons. If you are glycerin for food, beverage, or Medical applications, you must use a Glycerin USP product. What do you mean Glycerin by the Gallon? Glycerin is typically sold in many different sizes. Purchase glycerin by the gallon or in drum quantities. Yes, there are not restriction on whom can buy glycerin. We sell direct to everyone. This product ship Fedex ground or LTL for drum orders. ChemWorld will not ship to PO Boxes. What is the freeze point of Glycerin? Glycerin is commonly used with water as a antifreeze. 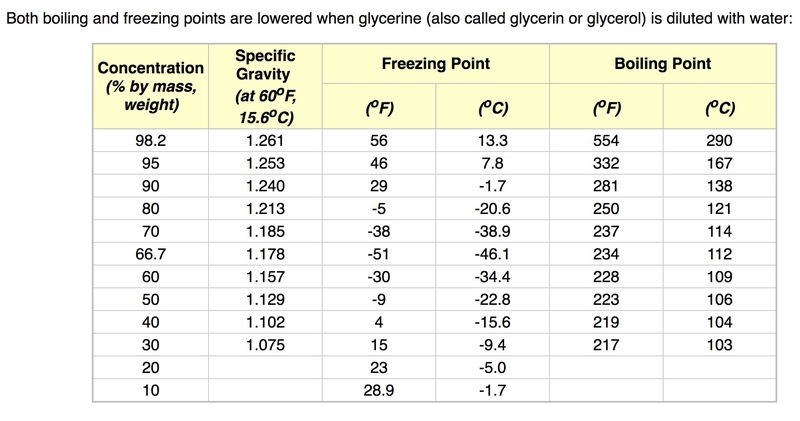 To learn more about glycerin freeze point, please refer to the glycerin freeze chart.